A rich curry sauce with butter, cashew nuts and fenugreek. Sweet and creamy Makhani cooking sauce with cashews, cardamom and green chilli. 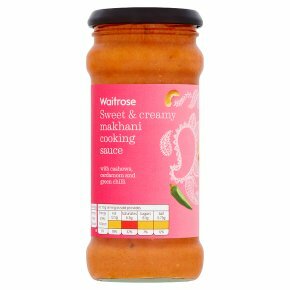 INGREDIENTS: Tomato purée, water, butter (milk) (8%), double cream (milk) (7%), low fat natural yogurt (milk), onions, sugar, maize starch, cashew nuts (2%), ginger purée, garlic purée, paprika, concentrated onion juice, rapeseed oil, salt, acidity regulators lactic acid, acetic acid and citric acid, yeast extract, onion extract, cardamom powder, dried fenugreek, green chillies, toasted onion powder , cassia, coriander, chilli powder, cumin, allspice, ginger, cloves, nutmeg, fennel, dill, black pepper, mace, aniseed.